Tōn en tēde tē biblō periechomenōn onomata kai taxis : Aristotelous bios ek tōn laertiou = Eorum quæ hoc uolumine continentur nomina & ordo. Aristotelis uita ex Laertio. Venice : Aldus Manutius, Romanus, February 1497. Chronologically the third of the five volumes of Aristoteles's Opera printed by Aldus Manutius in 1495-1498, but considered by him to form the first, see the dedicatory letter on leaf [star]1v and Walsh, 2644. Collation: [star]⁸ [dotted X]⁸ [cross]⁸ [Os]⁸ a[alpha]-z[psi]⁸ & [omega]⁸ A-B⁸ C[Gamma]⁶ D[Delta]-H[Theta]⁸ I⁸ K⁶: 300 leaves, leaf l[lambda]8 blank. Errors in foliation: leaves 5, 29, 34, 95, 99, 113, 217 misnumbered 8, 28, 24, 69, 95, 121, 117 respectively. Imprints from colophon and privilege (leaf K6r): "Excriptum Venetiis manu stamnea i[n] domo Aldi manutii Romani, & græcorum studiosi. Mense Februario .M. III D. / Impetratu[m] est a dominis Venetis ide[m] in hoc quod in cæteris impressis græce domi nostræ." Manuzio issued the entire Opera in five parts, dated: I) Organon, 1 Nov. 1495 (PML 1126/ChL 989); II) Physica, Feb. 1497 (PML 1127/ChL 997, PML 19117/ChL 997 c. 2); III) De animalibus, 29 Jan. 1497 (PML 1128/ChL 995); IV) Theophrastus, De historia plantarum, 1 June 1497 (PML 1129-1130/ChL 998, PML 34896/ChL 998 c. 2, pt. 1 only); V) Ethica ad Nicomachum, June 1498 (PML 1131/ChL 1008). Printed catchwords, except in quires a[alpha]-e[eta]. Printed foliation, running titles and catchwords. Text in Greek, preface in Latin. Title from first page with lists of contents in Latin and Greek on leaf [star]1r. Variants signalled in CIBN A-504. Woodcut head-pieces and initials throughout. 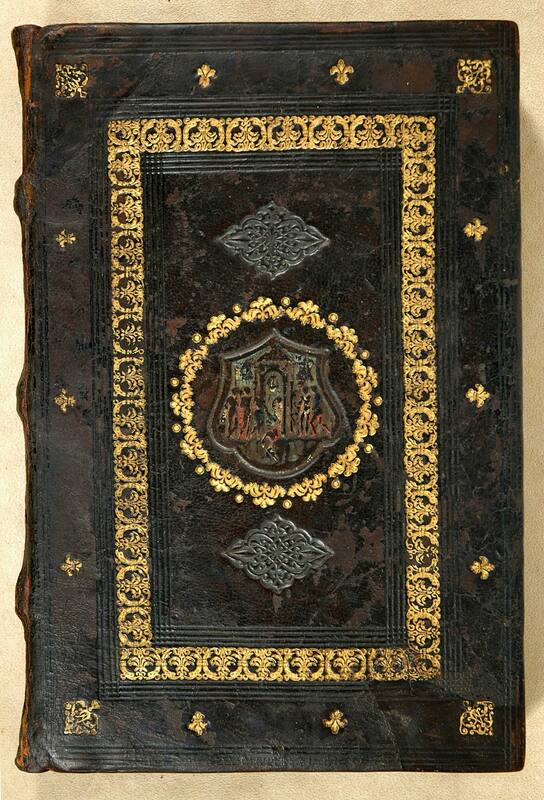 16th-century Italian gilt-tooled calf over paper boards (31.2 x 21.5 cm), sewn on 4 supports; repaired by Duprez Lahey and Carolyn Horton (condition report on inside cover of PML 1126 box). Plain paper pastedowns; plain endbands; gilt edges. Hand decoration: No rubrication necessary. Annotations: No marginal notations. [Joseph Juste Scaliger (1540-1609), note in Heber catalogue; Scaliger sale, Leyden, 11 March 1609, p. 10; Gerard Meerman (1722-1771) and Johann Meerman (1753-1815); Bibliotheca Meermanniana sale, The Hague, 1824, p. 216, no. 466; Richard Heber (1773-1833); Bibliotheca Heberiana sale, Sotheby's, Part I, 10 April 1834, lot 503, purchased by Payne and Foss, booksellers; Mr. Miller of Lincoln's Inn (see Acheson note); James Bohn, bookseller to Acheson]; Archibald Acheson, Earl of Gosford (1806-1864), bibliographical note citing earlier provenance (formerly in box with PML 1126, now in departmental file); James Toovey (1814-1893); Pierpont Morgan (1837-1913), purchased with the Toovey collection, 1899.